Steele Canyon’s Cougars left their paw prints all over West Hills High School on Saturday, November 12, 2016, sweeping the Grossmont Conference Finals in all four boys and girls JV and varsity categories. 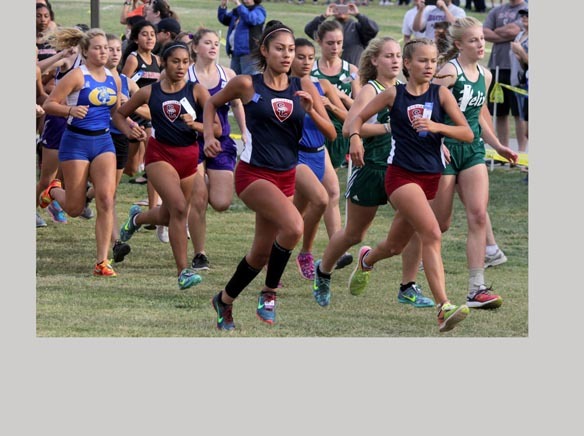 Both Steele’s varsity boys and girls ran in wins 56-points over their nearest competitor, Grossmont, and the JV boys pulled out a nail-biter, taking first from Valhalla by one point. Steele’s JV girls set the tone for the day, finishing the first race of the morning with a 15-point score, despite less-than-ideal beginnings. Seconds after the start of the girls JV race, a Grossmont runner tripped and the athletes were called back to starting positions. Thirteen of the first 15 runners to cross the finish line were Cougars. They placed 62 points ahead of Grossmont’s second place team. Although Steele was the official host of the race, West Hills provided the course. Wolfpack head coach Bill Cleves said running the final race at West Hills was fun. Cleves, who started coaching the Wolfpack in 1983, is retiring after this season. He said he feels no nostalgia for his last race, but believes cross country is a sport that keeps people coming back. Cougar senior Luis Pina finished third in the boys varsity race (16:00), right behind El Capitan’s Matt Machnov (15:47) and Granite Hills junior Brady DeHaven (15:45). Freshmen ladies made their mark on the girls varsity race. El Capitan freshman Carolinh Calvert (15:57) came in first, with Cougar freshman Makenzie Wray (16:01) clawing at her heels. Isaac Chavez (14:27) from Steele Canyon took first in the boys JV race and Dylan Schubert from West Hills and Alex Leiu from Valhalla closed out second and third, both finishing at 14:35. Crossing the finish line nearly a half minute before the rest of the pack, Cougars Molly Rehl (17:03) and Jizelle Cortes (17:04) brought home first and second in the girls JV race, to be followed by eleven more teammates in the next 74 seconds. Grossmont took second in three of the races, with Valhalla and West Hills battling for the remaining second and third place positions.